Companies across the various travel and transportation industry segments – airlines, airports, railways, freight logistics, hospitality and others – have been handling large amounts of data for years. But do they have the analytical prowess to turn that raw data into insights? In today’s instrumented and interconnected world, unprecedented amounts of data are captured from almost every kind of system or event – and much of it is unstructured data. From passenger name records, transaction history and pricing data to customer feedback surveys, call center logs and twitter feeds, travel and transportation companies have a lot of data on their plates. And travel and transportation CEOs rank this “information explosion” among the top drivers of transformation for their organizations. 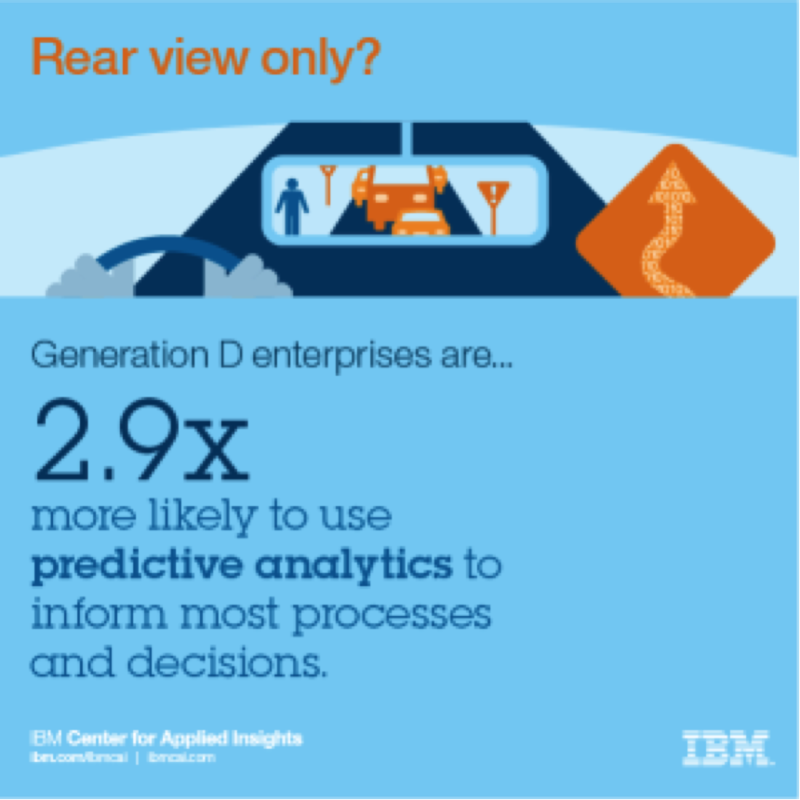 According to the recent IBM Center for Applied Insights study, Inside the mind of Generation D, the travel and transportation industry as a whole generally lags in terms of how data is used. For example, travel and transportation companies are surprisingly behind in predictive modeling, simulations and next best action modeling – all areas necessary to run operations efficiently and target customers effectively. Because some passengers see travel as a commodity product to get from A to B, it is essential for travel and transportation companies to differentiate themselves by creating a seamless end-to-end journey. Big data and analytics can help create a comprehensive 360-degree view of the customer to do just this. By dramatically improving customer interactions at every touch point across the end-to-end customer experience, travel and transportation companies can improve customer loyalty. More complete “persona-level” customer profiles can help companies discover new ways to interact with individual customers, as well as improve service delivery and marketing strategies. Here’s an example. To improve the effectiveness of its loyalty program and increase the lifetime value of each customer, SEA Aeroporti di Milano implemented an intelligent customer experience and airport loyalty program that provides a personalized passenger experience throughout the Milan Airport. The system automatically loads customer purchase data, allowing customer segmentation, customer spending analysis and traffic management analysis. With this capability, SEA can now target passengers with specific marketing promotions and opportunities based on the insights delivered from the analytics on this data. Because travel and transportation companies face capacity constraints, a sharp focus on capacity and pricing optimization is crucial. The ability to analyze more historical information with higher frequency – even in near real time – allows for more dynamic and smarter pricing actions, optimized capacity planning and effective yield management. For example, TUI Travel plans its holiday offers in advance, enabling it to calculate and book the required transport and accommodation facilities early at a lower cost. But if a customer desires change, the company must alter its plans at short notice. By deploying advanced analytics designed to optimize capacity planning, TUI can detect and rectify gaps between planned capacity and actual demand to optimize their planning processes. By enabling flexible vacation planning and easy schedule changes, the company is now even more competitive. TUI spends 66 percent less time preparing for new planning cycles and can generate reports 50 percent faster than before. In the asset-intensive travel and transportation industry, success depends on the safe and reliable performance of those assets. By capturing and analyzing more complete operational data, big data and analytics can help organizations manage and maintain their assets to improve safety, performance and equipment life. A U.S. freight railway needed to better manage its 230,000 train cars along 32,500 miles of track. The railway wanted to “listen” to the data that every wheel of every train car was producing. By predictively analyzing 100,000 data points a day, the railway is now able to detect changes in speed, temperature, vibration and alignment – all factors that could cause a derailment. With the help of analytics and predictive maintenance, trains now have less downtime and potential problems can be detected before they occur.